Pack Includes: Puppy Toy with vibrant colours, high quality fabrics, crinkle sounds and patterns to help stimulate visual and tactile stimulation. Large clip to attach onto most prams, pushchairs or cots. Pull the tail of the Puppy and watch him wiggle! Will put a smile on baby’s face. This toy costs approximately £16.99 (for the latest and best prices make sure you check our retailer list for the Playgro Puppy Gift Pack above). 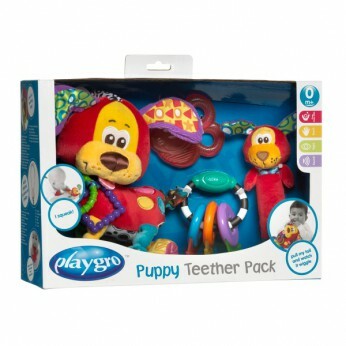 In our review of Playgro Puppy Gift Pack we classed it as being suitable for ages 0 to 11 months but recommend you check the manufacturer specific advice before purchasing.